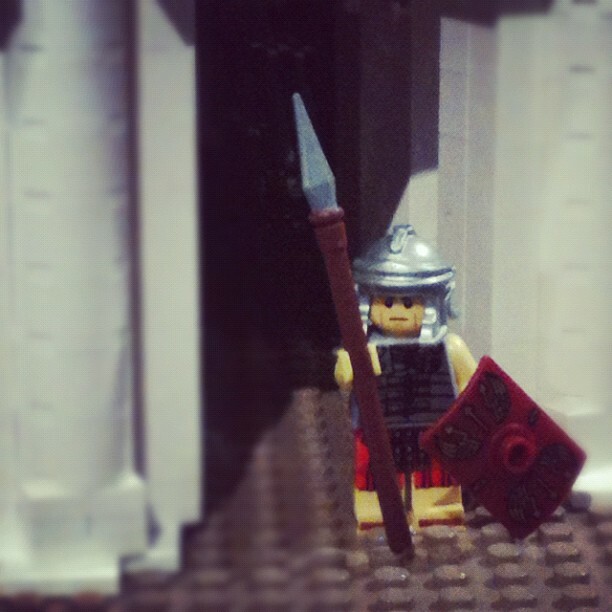 Max Chalmers discovered that LEGO Rome wasn’t built in a day either. He came, he saw, he LEGOed. Thanks to certified LEGO professional Ryan McNaught, the Nicholson Museum is now host to the largest ever LEGO model of Rome’s colosseum. The model consists of over 200,000 LEGO bricks, weighs 100 kilograms, and took 400 hours to build. The model was commissioned by the Nicholson Museum as part of an exhibit featuring coins, sculptures, and artefacts from the Roman Empire. The LEGO colosseum includes immaculate cut away detail revealing the building’s inner chambers, stairwells, and gladiator battles, over which a LEGO Emperor Titus presides. “He’s giving the thumbs down there. I don’t know if you can tell because LEGO people don’t have thumbs,” Mr McNaught said. Curves and crumbles proved the most intractable architectural problems for Mr McNaught. Four whole days were spent designing a prototype Roman arch which young volunteers were recruited to build hundreds of times over. In keeping with Roman labour practices the children were not paid for their work. Many more hours were passed patching together single LEGO blocks so that one side of the structure appears in its contemporary rubble state, weathered by centuries of Italian seasons. However, not all of the building was reconstructed with complete historical accuracy. Keen-eyed observers will notice a contemporary pope-mobile parked alongside the colosseum walls. Instead of a papal leader it contains Darth Sidious, the popular Star Wars LEGO figure which Mr McNaught employs as his anachronistic trademark. After construction in Melbourne the set was nerve-wrackingly boxed up and trucked to Sydney. Addressing the school holiday crowd, Mr McNaught spoke about his fear of breaking the painstakingly detailed model. “I actually used to have a full set of hair when this project started,” he joked. Mr McNaught has experienced LEGO heartbreak in the past. A massive LEGO Airbus A380 he built was destroyed, ironically, while returning by air from the United States. He knew something had gone wrong when he noticed little blocks of LEGO trickling out along the luggage carousel. The LEGO colosseum is on display at the Nicholson Museum until January 2013.